For the many times that your child is with you in the car or traveling somewhere, you will need toys for the car seat for the baby to enjoy. Very busy parents can spend hours in the car driving to the many places they must go, and this is time wasted for your baby if he or she does not have something to interact with and keep them occupied. Manufacturers have created toys that go directly on the seats of the car or right on the handle of the car seat itself for this purpose. 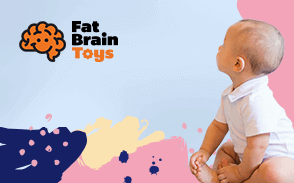 We feature the best-rated and the most-reviewed of these special toys that attach and detach easily in this informative buying guide just for you. We are happy to spotlight these outstanding playthings for your enjoyable shopping experience. 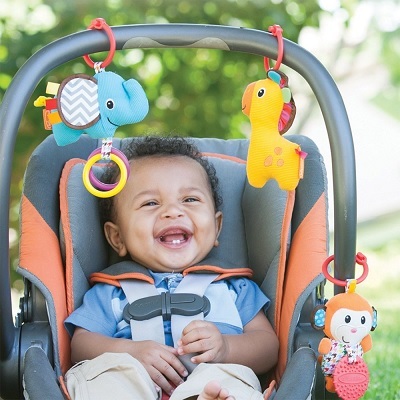 Here are the best baby car seat toys in 2019. For this update, we focused on removing out of stock products. We also narrowed our list to include only the most popular and well-reviewed products that are currently in stock. 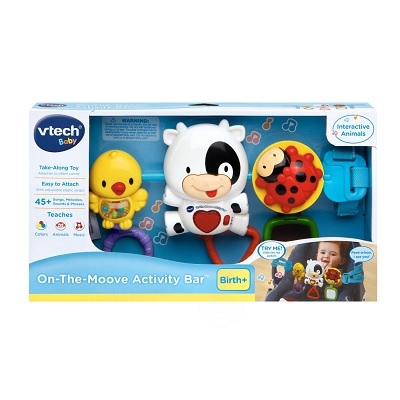 With a whole line of colorful and interactive fun, the Vtech baby On-The-Moove Activity Bar includes a pretty ladybug, a cute bird, and a sounding cow. 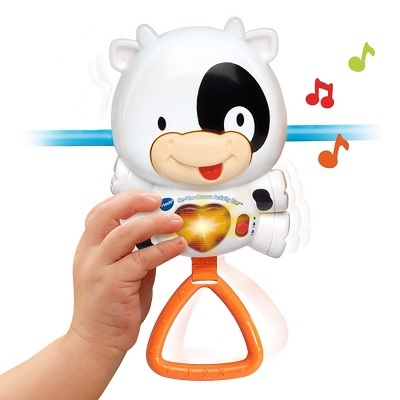 The cow has a heart button to press for playful melodies, songs, and cheerful phrases, plus a light. There are more than forty-five things to hear and learn, and the sounds can also be heard by swinging the cow. The sweet yellow bird holds a textured ring that builds motor abilities and a belly full of colorful beads that rattle for auditory talents. Each amazing toy has a colored ring to grab and hold. A mirror is attached to the ladybug toy for the infant to see themselves. 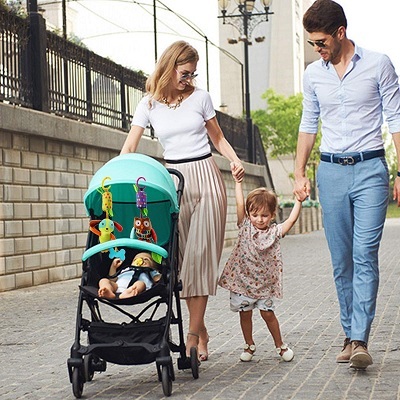 This incredible plaything attaches to most portable modes of travel, such as strollers, car seats, and carriers and is perfect for newborns and older babies. It features elastic straps for attaching that are simple to adjust and requires batteries for sound operation. Many abilities will be gain by the baby that interacts with this wonderful plaything. They will enhance their motor, cognitive, auditory, visual, finger dexterity, pulling, and grabbing talents easily. Your child will be enchanted with this lovely toy for hours if needed. There are so many things to do, such as looking in the mirror, chewing on the teether, and moving the cow for the fun noises and music. This cute Vtech plaything has a below-average price. It has the superb qualities of having several individual toys, making sounds and phrases, and being multi-textured for long engaging play. 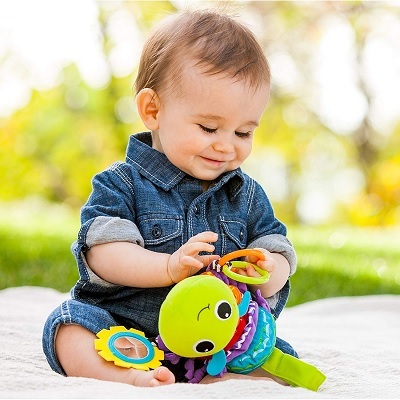 The OBall Flex ‘n Go Activity Arch Take-Along Toy is great for newborns and older and is constructed of flexible and soft Oball material. It has three toys attached that are removable that include an elephant rattle, a small Oball, and a lion that rattles. 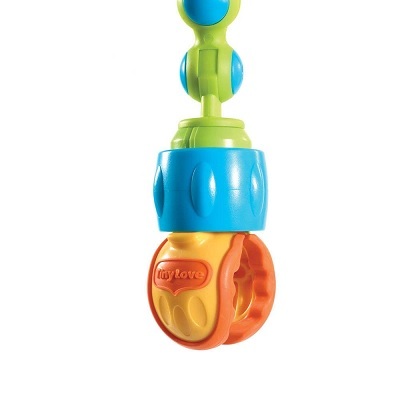 There are four loops to link with other toys, as these toys detach to be played with individually as hand toys too. 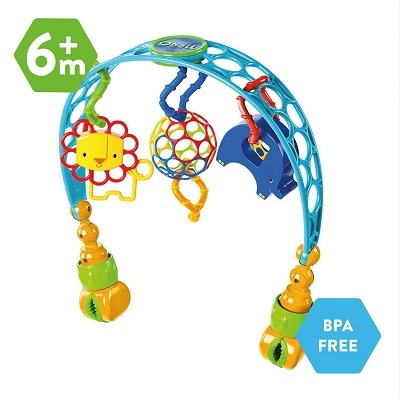 The colorful arch connects simply to the car seat or stroller for long-time fun and activity that is very colorful and engaging. 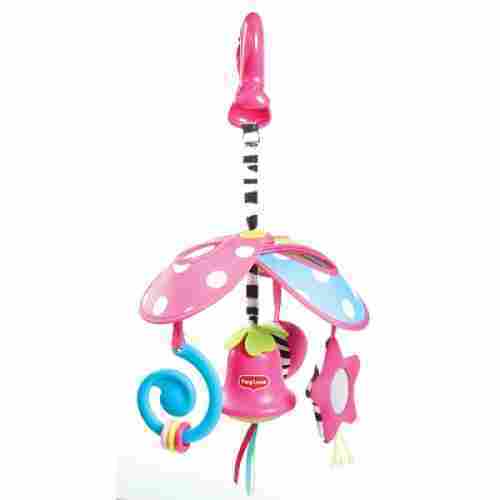 It can be adjusted and rotated for the best position for the child, so the baby can easily reach the hanging toys. This marvelous product promotes motor abilities, cognitive skills, and hand-eye coordination among other talents. The flexible and soft Oball material is used to make the arch for this fabulous toy and also for the hanging small ball. 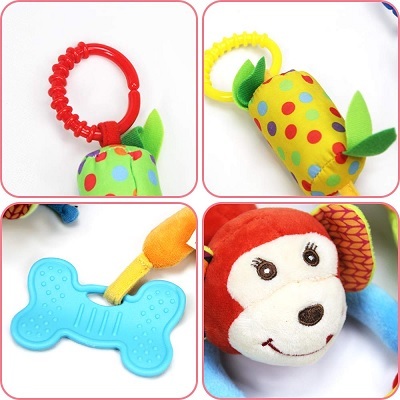 It can be used as a comfortable teether that the child can munch on happily. You can remove the toys that are on this arch and add other toys you refer. This will keep the child interested and always engaged in the various toys to explore and view. Having a below-average cost, this amazing plaything derives its value from being constructed of the soft Oball material, teaching many skills, and including removable toys. 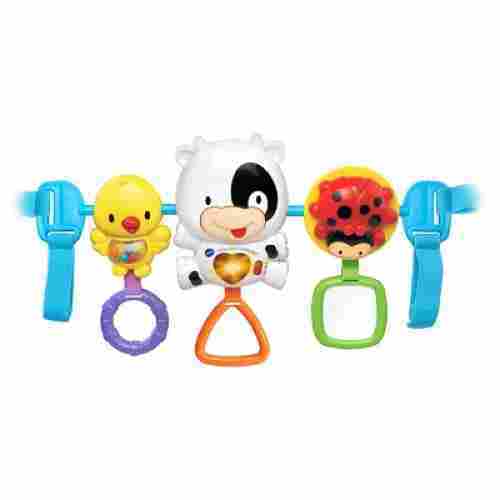 The Infantino Tag Along Travel Pals is a happy colorful set of small hanging toys. That are perfect for a car seat, stroller, or carrier. They can be attached also to cribs and play areas, as the combo includes an elephant, giraffe, and a monkey. 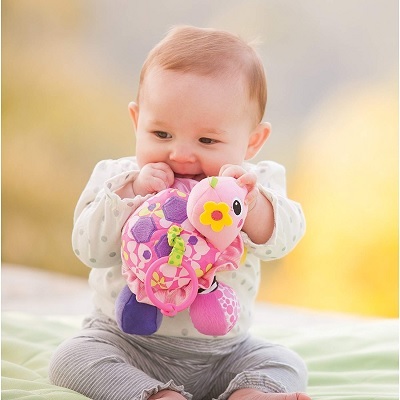 The elephant has click-clack rings and satin soft accents, and the monkey features a teether for chewing. The giraffe is crinkly and soft, and all encourage grabbing, holding, and batting. This wonderful item promotes visual, auditory, and hand-eye-coordination in play and develops finger dexterity and motor abilities. Several skills will be exercised with these simple charming toys. They include clackers, a teether, crinkly material, and soft fabrics that will engage the infant as they enlighten their senses. This sweet trio of small detachable toys is versatile in how and where they can be used. 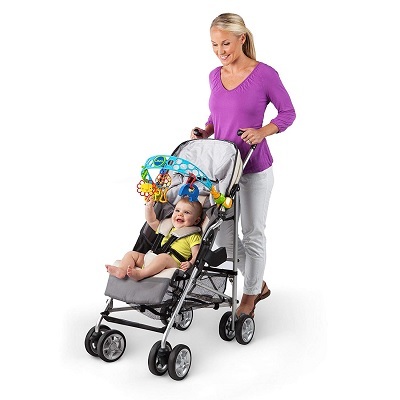 Put them on a stroller, a crib, a car seat, or a carrier to entertain the baby. They are also great hand-held items too. With a below-average price, this cute set of hanging playthings can be attached in several ideal places, is colorful and engaging, and develops many skills and talents in the young child. With over 2,500 online customer reviews, the Tiny Love Take-Along Arch is offered in six various color schemes and is perfect for newborns and older infants. It includes a flexible arch that can be adjusted for the angle that is within a good reach for the infant. This splendid plaything teaches the cause and effect principle with the sensory and batting exploration. It includes a propeller to spin, a crinkly frog, and a bead ball that spins. 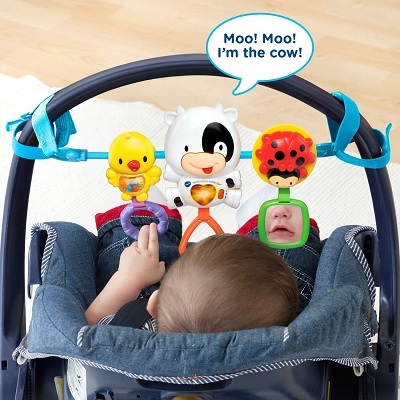 The hanging toys are easy to grab for teething, and the mirror lets the child see themselves. The clip attachment is universal and should fit most car seats. 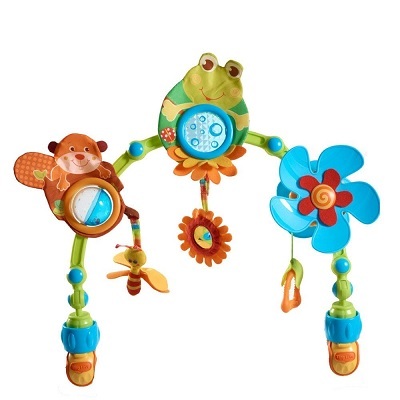 Included are a soft frog, a cute squirrel, and a pretty flower on the arch plus three smaller hanging toys that promote motor abilities and batting in very young babies. As their hand abilities improve, they will begin to grab the toys instead of just hitting at them. You can choose from six various themes for this terrific plaything. They each have different animals on the top of the arch, plus a good mix of smaller items that hang from the top. The baby will learn how to kick, bat, and grab these cute toys on the arch, as you drive the car. They will have plenty of time to explore each small toy in detail and eventually learn how to grab and teeth on them. The cost for this amazing toy is above the calculated average. It has the great qualities of containing several fixed and hanging toys on the arch, being in an arch shape that the child can easily reach, and giving practice with batting, kicking, and grabbing objects. 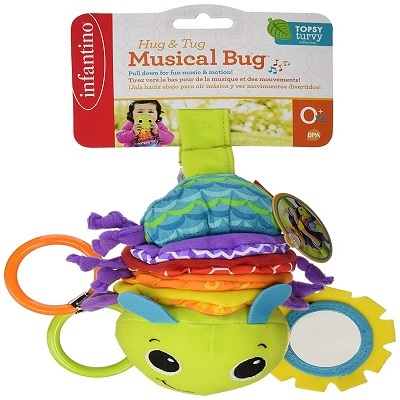 Perfect for strollers, cribs, and car seats, the Infantino Hug and Tug Musical Bug can be pulled for activities, motion, and music. It generates music for up to ninety seconds, as the bug moves up the cord when it is pulled. 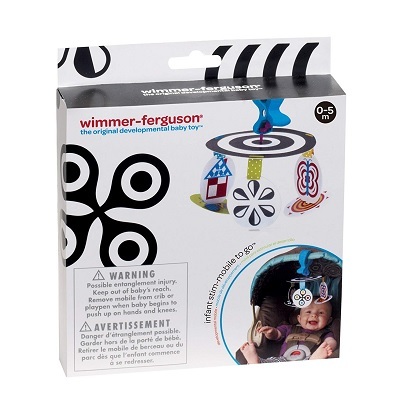 This splendid toy has knotty legs, a fun mirror, and two clacker rings, plus it is free of BPA. 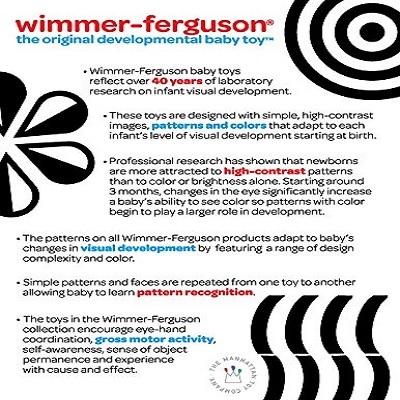 Your child will begin to explore the many fabrics and textures that make up our world with this terrific first toy. 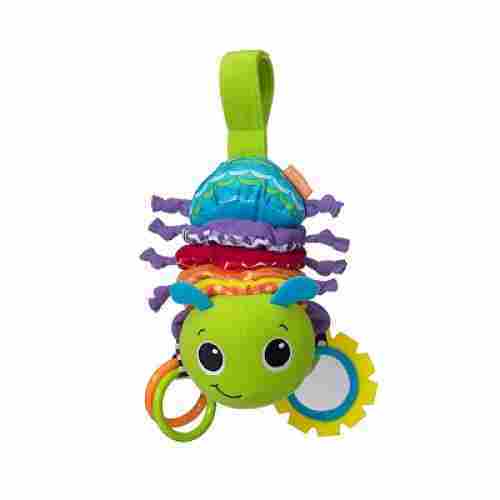 Colorful and exciting, this cute bug has a cute smiling face and can detach for a hugging toy for sleeping and napping. The many textures on this compact toy are remarkable. There are clackers, a mirror, a soft body, and knotty legs to play with and keep the infant entertained for hours and hours. When this adorable bug is pulled on its cord, it will make music as it slowly climbs back up. 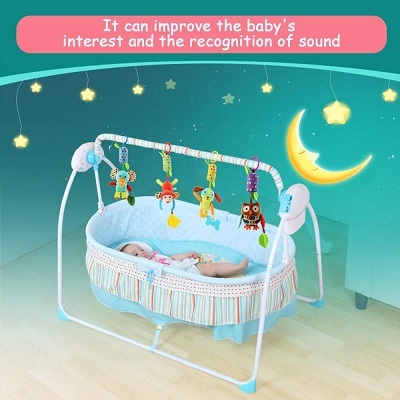 This will delight the baby and increase his or her auditory abilities along with the visual effects. This excellent plaything has a below-average price when compared to the others on this list. It derives it value from being able to attach to many places, making music, and having multiple textures for the baby to experience. 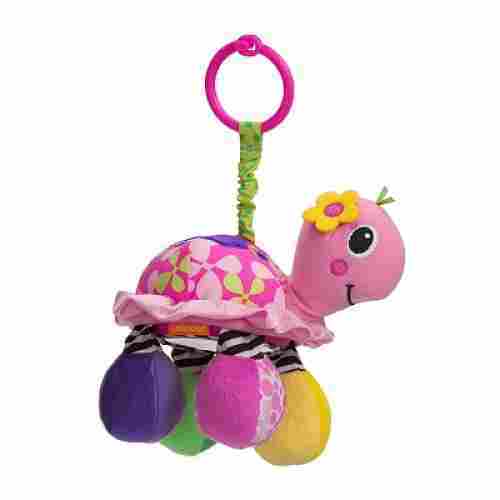 Encouraging grabbing and batting with the multi-colored feet that rattle, the Infantino Sparkle Topsy Turtle Mirror Pal is a sweet colorful turtle toy that teaches colors, auditory, visual, and motor abilities. 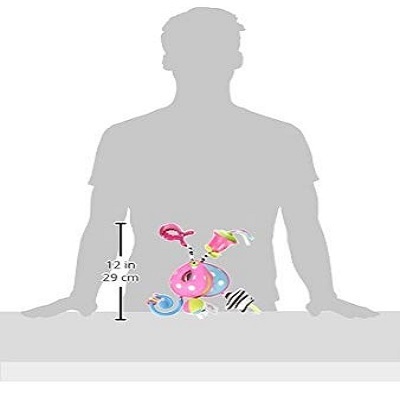 The bottom of the belly is a mirror that the child can use to explore their own image in engaging hours of exciting fun. He or she can bat or kick the body and the feet of this sweet toy to hear its noises and gain the muscle strength they need. It attaches quickly and easily to diaper bags, car seats, strollers, and carriers that hold the child as you travel or go about your daily routine on the go. One of the first physical movements of infants is to kick and bat at things, especially hanging items. 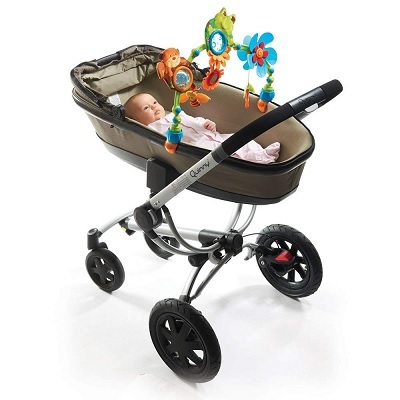 This fantastic plaything gives your baby plenty of opportunities to do that while being on the go. The peek-a-boo mirror under the body of this perfect turtle gives the child a chance to view their own image. At first, they will think another baby is hiding underneath in fun hiding pleasure. 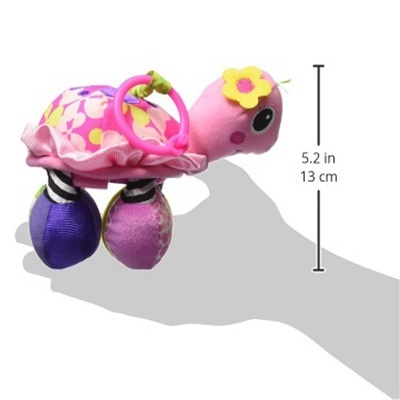 This cute little turtle has the lowest cost of all listed products. It derives its value from being colorful and eye-catching, teaching several skills, and encouraging progressive movement from the child. 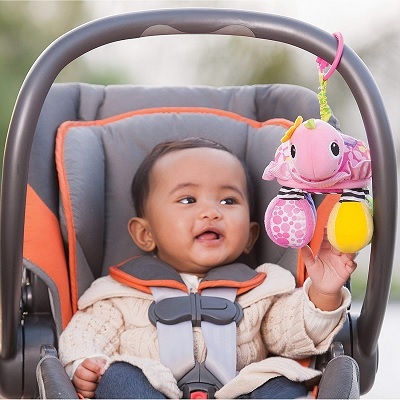 Made by the original innovator of developmental black-and-white playthings, the Infant Stim Mobile to Go travel Toy connects to most infant carriers, car seats, and strollers with a strong and durable clamp. It develops multi-sensory, high contrast, and visual skills in infants with the color and black-and-white graphics and is easy to pack for travel and lightweight. Ideal for newborns and older, the colorful cards can be flipped to get the child used to the color side and the black-and-white side. This is an innovative design that has been safety tested for quality and assurance. Getting babies used to the contrasting colors of white and black along with the many colors possibly takes a while. They should get an early start with toys such as this one that gives them a good beginning. 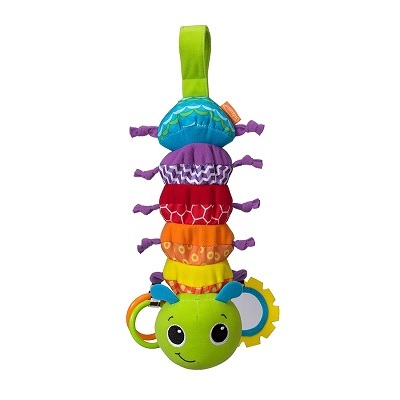 The large colorful clip on the top of this impressive toy will hold it almost anywhere you want. 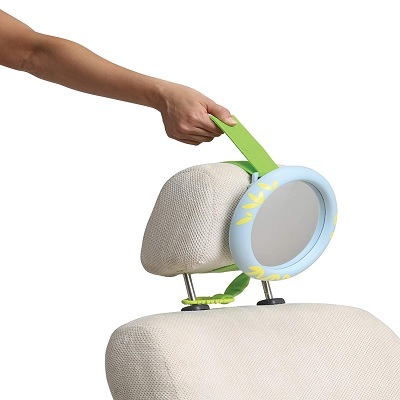 Clip it to wherever your child can see it while in the crib, car seat, stroller, or carrier. 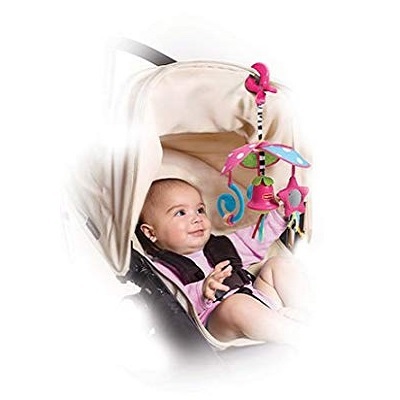 With a below-average price, this wonderful toy for car seats has the great features of being lightweight and easily packable, giving practice with color and black-and-white images, and being attachable almost anywhere you want to put it. The Tiny Love Pack and Go Mini Mobile is an adorable colorful mobile That attaches easily to most car seats, strollers, and cribs. It can fold up quickly to fit in your hand and can be carried anywhere you want to go. Babies are attracted to the patterns and stunning colors that include shades of blue, pink, and white and black animal print. 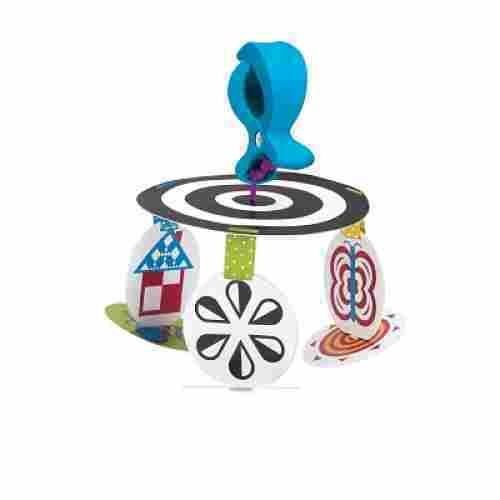 A cute bell in the center of the mobile will sound when touched, plus it also includes a rattle ball, a star mirror, and a spiral rattle for hours of entertainment and thrills. Several activities will keep the infant busy on this beautiful plaything. 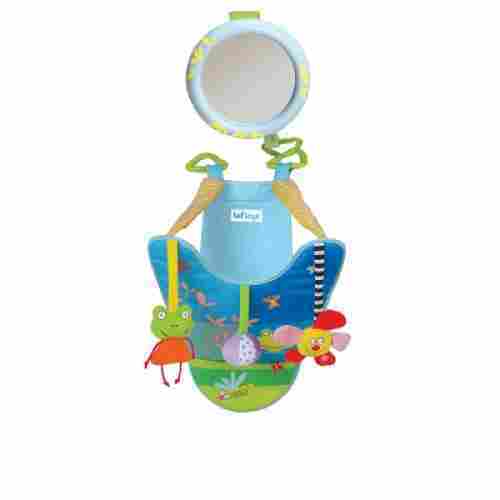 There are a mirror and two rattles that spin around for the child to grab, kick and grab to develop those needed muscles. When you need a toy that does not take up much space in your bag or diaper bag, then try this sweet mobile. It folds up and can fit in your hand for a compact size that is sure to please. The price of this adorable mobile is below-average. It has the great features of plenty of engaging colors, several activities to entertain, and being portable and flexible for travel. 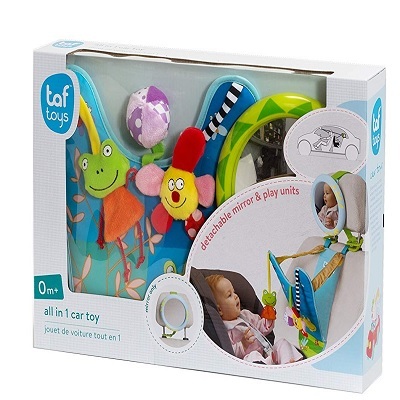 Ideal for infants placed in the car that are rear-facing, The Taf Toys In-Car Play Center includes a large mirror so driving parent can see the infant clearly. It works only with cars that have metal poles for adjusting the headrest on the seats and is bright and colorful. This toy has two plastic triangle rings that secure to the poles of the headrest and Velcro straps for convenience and height adjustments. It soothes and entertains babies, especially those that do not like riding in the car. Featuring a ball with jingling bells, a crinkly frog, and a rattling flower, it aids with gross motor abilities, visual skills, and auditory talents. To inspire parents to put infants facing the rear of the car, this toy only works in cars with adjusting poles in the headrest. 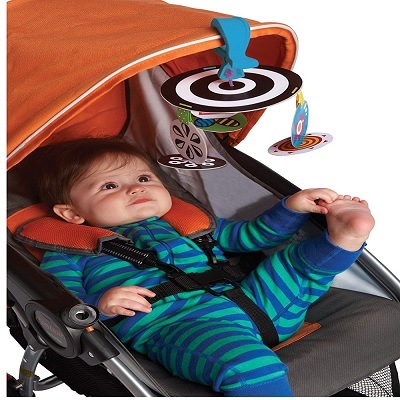 This position will keep babies the safest in the car, which can be seen with the mirror that is included on this terrific plaything. The infant can become quite involved with this multiple toy. There are several sounds to hear, various textures to feel, and beautiful colors to enjoy while taking a ride in the back seat of the car. This is the most expensive item on this list, as it is the largest toy with several individual toys on it. 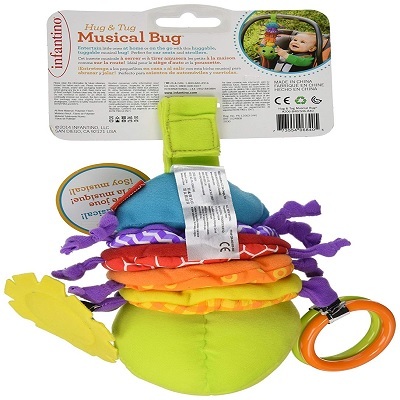 its works only for backward-facing babies, has plastic rings and Velcro for attaching and adjusting and has various sounds and textures for involved play. This collection of Soft Hanging Crinkle Squeaky Sensory Toys is a set of hanging toys that includes a cute monkey, a silly dog, a hoot owl, and an adorable elephant. The patterns are high-contrast to enhance the infant’s visual skills, and the items are perfect for newborns to eighteen months old. 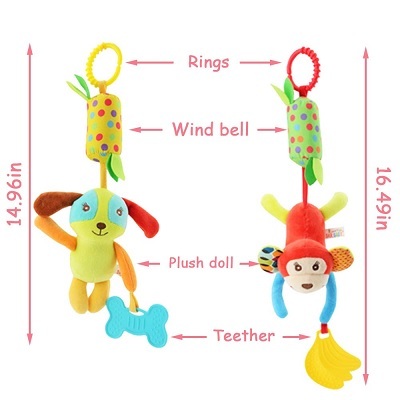 This group includes a wind chime in each toy that sounds when shaken, as well as other sounding parts of crinkly wings and ears and a squeaky belly. The wind chime makes a soothing, cozy, soft sound to calm the infant. 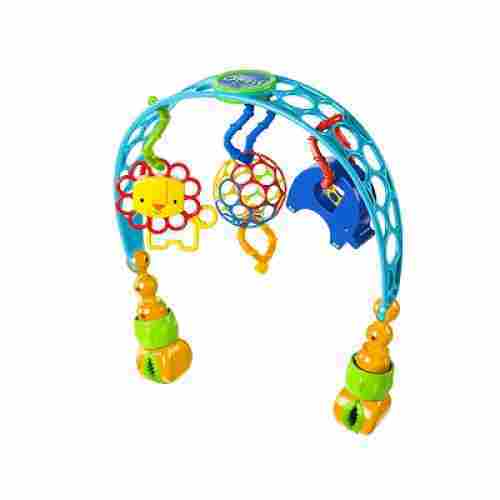 These wonderful playthings improve the grab and muscle abilities as well as the auditory senses of the baby. Each one keeps the child pleasantly entertained and makes a perfect baby shower gift. Hand-to-eye coordination and teething will be exercised with these incredible toys that are made of non-toxic BPA-free materials. This incredible set has C-clips on the tops to make them simple to hang on car seats, cribs, strollers, and diaper bags. They must be hand washed for the best care and make great substitute toys and replacements on floor sets, play gyms, and play mats. So many abilities and curiosities of the infant will be awakened and exercised for the child that is lucky enough to have these items. Their audible, cognitive, muscle and visual skills will get a good workout. With C-clips on the tops of these outstanding toys. You can attach them anywhere you place the infant. 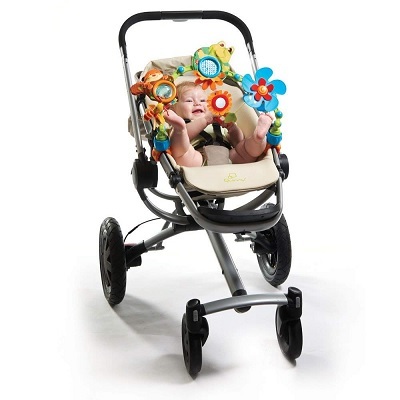 They are perfect for cribs, strollers, and car seats, as well as replacements for activity centers and gyms. With an above-average price, this set of sensory toys has the great qualities of being a nice set of four toys, capable of making various sounds, and being flexible to attach almost anywhere you want them. 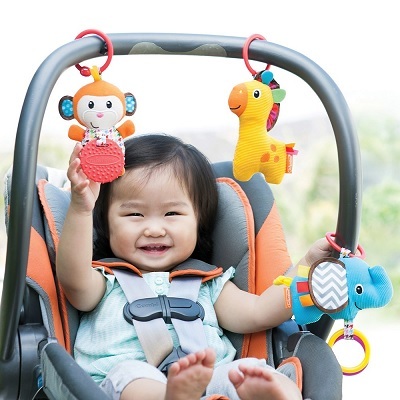 Each of these car seat toys is perfectly suited for a travel toy for the car seat, stroller, or carrier because they attach in a hanging position for the child to play with. They are small or in an arch to attach to the handle or the car seat to keep the baby entertained while the parent drives the car. Infants should always have something to occupy their time, instead of just sitting looking at a blank car seat. It is valuable time that they can be enjoying some of the best car seat toys that manufacturers are making. These items are all so simple to install in almost any place you put the baby. They have easy clips of C-hooks that can be attached and detached quickly to move them from place to place. The baby can look at the beautiful colors and designs, kick and bat at the individual toys, look at themselves in the included mirrors, teeth on the teething pieces, and pull on the hanging forms in front of them. These simple playthings can keep them busy for the many hours you both spend driving in the car. The busy infant is a happy baby that is gaining needed skills for early development and abilities. 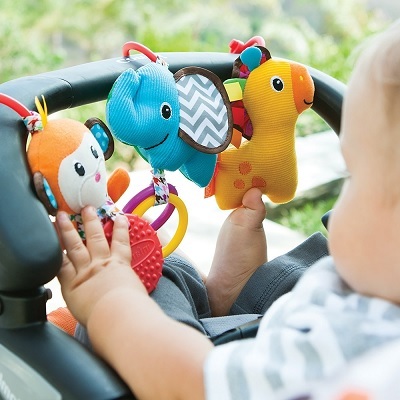 The rattles, crinkly materials, soft fabrics, teethers, and moving stuffed animals give the baby plenty of fun colorful objects to play and engage in the car. Many skills are developed with this simple play, such as motor, cognitive, verbal, auditory, visual, hand-eye coordination, finger dexterity, and muscle building talents. These are all needed and gained in interactive play with such creative toys. We like to give you an idea of the value that you will receive when purchasing these car seat toys for the online prices stated. We figure an average using all of the current prices to have an average to compare each individual cost with separately. we do not list specific costs because these amounts change often, and we do not want to give you the incorrect prices. We do, however, list them as average, above-average, or below-average in price and list the main features that are outstanding for that item. 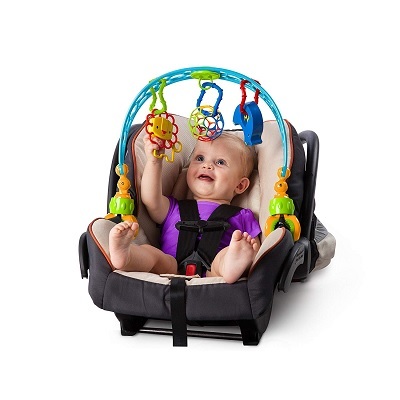 These car seat toys vary in their materials used, size, and abilities to entertain the child. of course, the larger more involved ones have larger prices than the smaller, simpler toys. The toy with the highest cost is the Taf Toys In-Car Play Center, and the lowest in price is the Infantino Sparkle Topsy Turtle Mirror Pal. 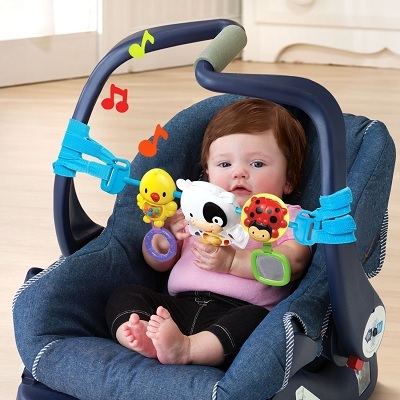 Car seat toys that have texture, sounds, and lights provide the most engaging sensory experience. They will be more engaged and look forward to playing with their car toys when this experience is provided. We choose the best-rated and the most-reviewed items in a given category to feature in our informative buying guides. These highlighted car seat toys have all been chosen by online customers as the top products that manufacturers are currently offering. We hope to enhance your shopping experience and decision-making by giving you all of the necessary details to make a great choice for yourself and your family. In our helpful summary sections, we put our research details from the manufacturer’s product descriptions and from the customer feedback on each. Armed with this data, you can choose the perfect car seat toy for your child. The product listed with the most reviews is the Tiny Love Take-Along Arch with over 2,500 online reviews. With almost a perfect rating, the Infantino Tag Along Travel Pals set has the highest customer rating. q: How do these toys hook onto the car seat? Do they all attach the same way? Whether it is an arch of toys or just a simple toy that attaches to the car seat handle or backrest, these attach with C-clips, straps, or Velcro attachments to adhere them to the places the child can use them. No, they do not all attach the same way, but when the information on attaching was given by the manufacturer, we put the details in the summary section. q: Do any of these have small toys that detach and can be played within the hand? Yes, several of the individual playthings are attached to the arch or main toy with hooks or clips that can be detached. The baby can play with these smaller toys by holding them in their hands while they ride or at home. q: What are some of the basic activities of these car seat toys? 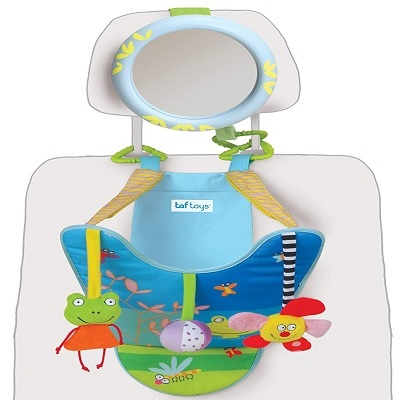 These lovely cute playthings have mirrors, teethers, rattles, crinkly fabrics, soft materials, stuffed little animals, handles, clacker rings, and buttons. Some of them make sounds and music to entertain the infant too. q: Are these appropriate for all ages of infants? Yes, the manufacturer age recommendations are for newborns to the age the child no longer needs the car seat. q: Should you leave these toys on the car seat even if the child takes no interest in them? If the baby is not upset by the toy, then it would not hurt to leave it. the child may eventually play with it, but there might be something on it that disturbs them. Leaving a toy on a car seat that the infant does not want to play with is just wasting their valuable learning time to gain new skills. A toy that they do not interact with is worse than not having a toy at all. It makes them just have to sit without any toys and you have wasted your money on something that does not interest them. Try changing out the toy with something else, and then possibly bringing back the disliked toy at a later time. q: Are these dangerous in any way if the child pulls on the toys or gets them off the car seat? No, these are not dangerous toys for pulling, batting, or kicking the whole toy or the individual playthings on them. These are all meant for infants to be rough with them, so they are made strong to withstand the rough play.